Lépine lived in isolation outside the artistic circles, devoted only to his work, and he essentially did not belong to his time, as he was one of the first to contribute, as appropriately stated, by M. George Lecomte ‹‹to ruin the academic landscape by learning how to render the effects of light and atmosphere››; therefore there is good reason to reclaim his rightful position to be among the promoters of the movement that influenced the modern School towards using bright colors; indeed from the beginning his works displayed a tendency to experiment with intense and bright colors, and with the remarkable effects of light. 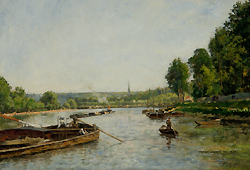 Considered as one of the forerunners of Impressionism, Stanislas Lépine made his reputation painting Parisian landscapes, particularly the River Seine with its steep banks, bridges and barges, and the old streets of Montmartre. Influenced by his childhood along the coast of Normandy, Lépine also produced numerous marine paintings mostly of port views in Caen and Rouen; and he became specialized in depicting moonlight views mostly in his imagery of ports and the canals of Paris. Stanislas-Victor-Edmond Lépine was born on October 3, 1835 in Caen, in the Normandy region of France. There is little information about his childhood and artistic formation. However, the writings available on Lépine, note that he probably came from humble origins, and that his father was a cabinet maker. During his childhood, he had a constant companion, Marie-Odile-Emilie Dodin, whom he would later marry, and have three children. At some point, Lépine pursued his studies at the Lycée Chaptal in Paris, although it is not known whether he had obtained a scholarship or not. (Robert Schmit, Stanislas Lépine, 1835-1892: Catalogue Raisonné de L'œuvre Peint, Paris: Editions Galerie Schmit, 1993, pg. xv). Being from Normandy, water would always play a pivotal role in Lépine’s artwork. In addition, he admired the Dutch painter Johan Barthold Jongkind (1819-1891), and was especially influenced by his marine pictures, which brilliantly captured the effects of air and atmosphere, as well as by his moonlight views. As noted by Athena S. E. Leoussi, Lépine “learnt from Jongkind not only how to paint ships accurately but also how to render the depth of the sky and the clarity of waves.” (Lépine, Stanislas,” Grove Art Online Dictionary) In 1859, Lépine made his debut at the Paris Salon with one of a number of nocturnes of the port of Caen that he produced at the time, entitled Port de Caen, Effet de Lune (Port of Caen, Moonlight Effect). Lépine always painted within a geographical area limited to Paris, its surroundings, as well as Caen, Rouen and other villages in Normandy. As a result, his subject matter did not greatly vary throughout his artistic career. Beside a number of portraits, mostly of his family, and some still-lifes, the subjects of his paintings could be divided into three categories: “first, those works dedicated to Caen, Rouen and the different port and village views in Normandy; second, those that depicted the surroundings of Paris, particularly the banks of the Seine and the Marne; and finally, paintings representing Paris itself, including Montmartre.” (Couper, pg. 81) He tended to repeat the same themes throughout his career, and his choice of imagery in Caen or Rouen were the ports; in Paris, views of the Seine at Ivry, Bercy, the canals of Saint–Denis and Saint-Martin, the Bassin de la Villete; and in Montmartre, the old streets of rue St. Vincent, rue Corot, rue des Saule, and rue de l’Abreuvoir. Lépine exhibited 37 works at the Paris Salons during his lifetime, usually a single work or a pair of paintings. Hardly noticed by the critics, and isolated from his contemporaries, it took him 25 years after his debut at the Paris Salon to receive some recognition. It was not until 1884 that Lépine received an honorable mention for his Le Pont des Arts (Bridge of the Arts) exhibited at the Paris Salon that year; however, this partial success was undermined by the fact that 54 other artists were honored at the same time. In 1874, Lépine participated in the first Impressionist Exhibition that took place at the photographer Nadar’s gallery, together with avant garde-artists such as Paul Cézanne (1839-1906), Camille Pissarro (1830-1903), Edgar Degas (1834-1917), Monet, Renoir among others. 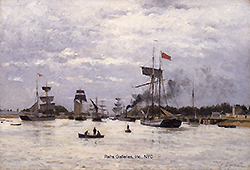 Two of his works traveled across the Atlantic in 1886, where they were shown in New York City in Works in oils and pastels by the Impressionists exhibition organized by Durand-Ruel. These were Le Pont Saint-Michel (The Bridge of Saint Michel) and Clair de Lune à Paris (Moonlight in Paris). Finally, Lépine received official recognition for his work, when in 1889 he received two medals. One was a first class medal for Le Pont de l’Estacade à Paris (The Bridge of L’Estacade, Paris) and Le Pont Royal (The Royal Bridge) exhibited at the International Exhibition, and the other a third class medal for Le Marché aux Pommes (The Apple Market) shown at the Paris Salon. Two years later, he received a second class medal in Madrid, however, unfortunately, this recognition came much too late. Stanislas Lépine died at the age of 57 on September 29, 1892, almost totally paralyzed. He was so poor that his friends had to collect money to cover his funeral expenses.